Strategic agreement will provide technology across global, senior-care network. grandPad®, respected for its ongoing commitment to seniors, is excited to announce an industry revolutionizing partnership with Comfort Keepers®, a widely recognized leading provider of quality in-home care for seniors and other adults. Starting in late April of 2016, Comfort Keepers will begin integrating grandPad senior tablets into its core services for seniors. This partnership allows Comfort Keepers, a Sodexo brand, long known for driving advances in the in-home care industry, to continue making innovations to senior care with the incorporation of transformational technology that improves its clients’ quality of life. grandPad senior tablets make the world more accessible to seniors by providing simple and safe ways to stay connected with family, friends and caregivers. The grandPad offers access to games, photo sharing, video chat and more. Together, grandPad and Comfort Keepers will facilitate communication between seniors and their families by incorporating technology as a gateway, rather than a barrier. With easy access to photo streams, email and video calling, seniors will be able to stay up-to-date on the activities of their family members and quickly reach out to loved ones by sending emails or making video calls. By integrating the grandPad into its core services, Comfort Keepers will also be able to more easily keep a client’s entire family informed on the condition, recovery and needs of their loved one. With more than 30,000 clients and more than 700 franchised offices globally operating under the Comfort Keepers and Amelis brands, this partnership allows Comfort Keepers to continue to transform the way in-home senior care is approached. grandPad and Comfort Keepers are excited to begin working together to transform the senior care industry and improve the quality of life for seniors and their families. To learn more about this unique integration, visit ComfortKeepers.com and grandPad.net/ComfortKeepers. Using technology to help bring families together, grandPad® provides innovative solutions that are intuitive, engaging, and safe for all age ranges. 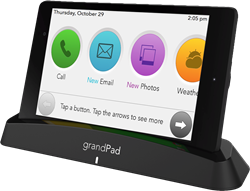 The grandPad is an innovative tablet based solution that privately connects the entire family on a platform built for seniors. With grandPad, seniors can video chat with the family, check emails in real-time, share photos, play games, and much more. The intuitive, easy-to-use design turns technology into a gateway instead of a barrier. grandPad is a privately held company based in Los Angeles, CA. For more information, please visit https://www.grandpad.net or follow on Twitter @grandpad_social and Live Grand®! Comfort Keepers® is a leading franchise network in the in-home care market for seniors and other adults needing care. Since its founding in 1998, the network has grown to more than 700 franchised locations around the world by staying true to the founders' goal of providing quality, caring in-home care services that allow clients the opportunity to age in place. In August of 2009, the brand was strengthened when the franchisor, CK Franchising, Inc. was purchased by Sodexo, a global leader that delivers Quality of Life services to over 75 million consumers in 80 countries each day. In addition to providing services that focus on health care and senior markets, Sodexo’s integrated offerings encompass more than 45 years of experience in reception, safety, maintenance and cleaning, food services, facilities and equipment management, and concierge services. For more information, visit ComfortKeepers.com.